Tim Mouncey slides in, with goalkeeper David Miskelly ready to react. The need to inject Portadown’s squad with big-game experience and a mental maturity led to Ronnie McFall picking up Michael Gault, Mark McAllister and Robert Garrett during a triple summer swoop. Suspension prevented Garrett from adding to his impressive debut season with an appearance at The Oval but McAllister and Gault both stepped up to shine on the semi-final stage. Confirmation of the wisdom behind the addition of such decorated players arrived, respectively, with the clock on three and 15 minutes as Portadown gained control from the first whistle to put shell-shocked Ballymena United on the backfoot. McAllister’s game may be defined by energy but the striker displayed impressive composure to capitalise on a defensive miscue and break the deadlock with an assured finish. Portadown’s previous semi-final showdown in 2013 ended with disappointment against Glentoran when McFall’s men failed to produce a performance - McAllister and his team-mates looked sharp from the start on Saturday evening and gained the perfect reward as a result. Ballymena’s attempts to regroup suffered a second blow when Gault cut inside and fired goalwards - with the experienced midfielder reacting first to convert the rebound after the initial shot was blocked on the line. Gary Twigg has proven value as a poacher but turned provider to increase the Portadown advantage with a pass inside to match the run of Peter McMahon. McMahon attacked the space between the Ballymena defenders then capped the driving run with a delicate lob over Dwayne Nelson. David Miskelly, so often the hero between the Ports posts, produced again at The Oval. He proved on hand to gather Allan Jenkins’ early header then punched clear a Darren Boyce cross and saved Gary Thompson’s driving shot. 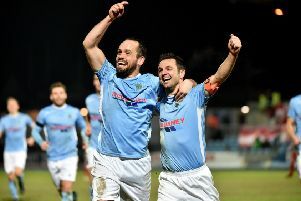 McMahon hit his own post with an attempted clearance but Ballymena cut the gap when substitute Boyce fired goalwards off Johnny Taylor’s pass and the shot deflected past Miskelly via Ross Redman. David Cushley was left frustrated by the outside of the upright and Miskelly stayed strong to prevent Boyce from adding to his tally. However, the Ports’ collective defensive work helped to protect the advantage secured by first-half collective attacking strength. In particular, Sean Mackle and Tim Mouncey - who remain two of the most maligned players on the Ports books - both proved superb in the 3-1 victory. Cup defeats of Linfield and Ballymena United have enhanced the reputation of this current Portadown squad as one capable of producing. One more example is now required next month at Windsor Park. PORTADOWN: David Miskelly, Sean Mackle, Ross Redman, Keith O’Hara, Garry Breen, Shea Conaty, Michael Gault, Tim Mouncey, Peter McMahon, Mark McAllister, Gary Twigg. Subs: Darren Murray (on for Twigg, 73 mins), Billy Brennan, Jordan Lyttle, Christian Stewart.